Other than out of ‘season short breaks’, all holidays start and finish on a Saturday. Tenancies commence at 4pm on your day of arrival and terminate at 10am on your last day. Please let us know your estimated time of arrival. Crumble Cottage is a strictly no-smoking cottage and smoking is not allowed inside under any circumstances. Linen is changed between holidays and a change of linen is provided weekly during holidays extending beyond one week. Towels are provided but these must not be removed from the cottage. Please bring your own beach towels. Please bring your own linen for the cot. a) We ask that dogs are not, at any time, to be left alone in the cottage. b) Only the number of dogs agreed on the booking confirmation will be allowed, unless otherwise arranged with the owners. c) We ask that your dogs are not to be allowed on any soft furniture down stairs or on the upstairs carpeted areas, ( no dogs on beds) . We have installed a gate at the bottom of the stairs to help you to enforce this request. d) We have a selection of various size dog beds/ dog mats for you to use, if required. e) We have supplied dog poop bags and a bin for you to collect any dog poop up in the garden areas. f) We have a wash tub / garden hose in ‘The dairy’ which you are welcome to use to wash down your dogs from mud or sand should you feel the need to, there is also dog shampoo and towels to use, if required. Electricity is included, the Gas for central heating and cooking is paid by coin meter which is located at the back door of the cottage. A “FULL” 1100 cubic foot of gas (measurement on gas meter) will be included which is sufficient for a normal weeks usage of gas. If Additional gas is required then it is up to you to feed the coin meter which accepts only £1 coins. “Owner”, “us”, “we” shall mean Mr Stephen Greening and Mrs Colleen Greening of Ty Mawr, Bethania, Llanon, Ceredigion SY23 5NL. “Tenants”, “you”, “your” shall mean or refer to the Customer’s party. The Tenant shall be entitled to occupy the property for holiday purposes only and this agreement shall not confer on the Tenant any security of tenure within the terms of the Housing Act 1988 pursuant to which the occupation shall be deemed to be by way of an excluded tenancy. A booking is only confirmed once we have received a deposit. We will then confirm your booking in writing. A provisional reservation will be held for 7 days. If we have not received a deposit within this time the reservation will lapse. This can be paid by Card payment online through West Wales Holiday Cottages Website or by arrangement by cheque or bank transfer. If a booking is made 6 weeks or more before the holiday starts, a deposit of £100 is payable. The balance is payable no later than 6 weeks before the start date. If your holiday begins less than 6 weeks from the time of booking, the full rent is payable. If the balance payment is not received by the due date, as set out in the confirmation letter, then the guest will lose their booking and the deposit will be forfeit. When you make a booking and we have received the required deposit, a legally binding contract exists between us that is non-cancellable and non-refundable, except in exceptional circumstances. You may still remain liable to pay in full or in part for the booking, even if you are unable to take your holiday. In the event of cancellation less than 6 weeks before a holiday begins the whole rent is payable unless we succeed in re-letting, in which case an administration fee will be deducted plus any discount that has had to be applied to the replacement booking and the remainder refunded. With more than 6 weeks’ notice, only the deposit will be forfeit. If for some reason you do need to cancel, it is important that you tell us at the first opportunity so that we may attempt to re-let Crumble Cottage and minimise your loss. We advise that you take out cancellation insurance to protect you against this loss. We like to fair and if you do need to cancel your booking we will do all we can to minimise your loss and entirely at our discretion we may vary the above cancellation conditions where necessary. Payment can be made by card payment option set out on West Wales Holiday Cottages website (or by arrangement by cheque or by bank transfer), details of which will be in our response to your booking request. Overseas guests may pay in sterling by using the card payment option set out on West Wales Holiday Cottages website. Any charges for payments from overseas will be passed on to the guest. The person making the booking must be aged at least 18 years of age and have the requisite legal capability to enter into a contract at the time of booking. Bookings cannot be accepted from groups of single people under the age of 18. 1. to pay for any losses or damage to the property unless the cost can be recovered under any household insurance held by the owner. 2. to take good care of the property and leave it in a clean and tidy condition on departure. We reserve the right to make a charge for extra cleaning if the cottage is not left in a satisfactory condition and may refuse to take a booking from that guest again. 3. to permit the owners and their cleaners reasonable access to the cottage. 4. not to part with possession of the cottage, or share it, except with members of the party listed when booking. 5. not to exceed a total 5 adults and one infant. 6. not to sell or transfer the booking to another party without our agreement. 7. not to cause an annoyance or become a nuisance to occupants of neighbouring premises. 8. not to smoke inside the Cottage. If there is a breach of any of these conditions by the guest or any of their party, we reserve the right to re-enter the property and end the holiday and ask the guest and their party to leave. If there is a breach of any of these conditions by us, then the guests have the right to end their holiday and leave. 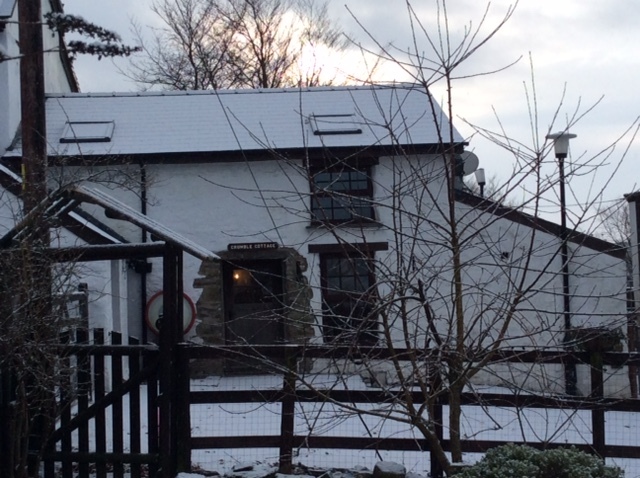 If for any reason beyond our control Crumble Cottage is not available on the date booked (owing, for example, to fire damage) or if it becomes unsuitable for holiday letting, all rent and charges paid in advance by the guest will be refunded. Under no circumstances will the Owner’s liability exceed the rental paid for the cottage (save for personal injury or death caused by the negligence of the Owner). We will not be liable for any act, neglect or default outside our control, nor for any accident, damage, loss, injury, expense or inconvenience, whether to person or property, which the guest or any other person may suffer or incur arising out of, or in any way connected with the rental unless we are responsible. In addition, we accept no liability for loss of or damage to the guest’s possessions in the cottage and garden. Nothing in these conditions excludes or limits our liability for death or personal injury caused by our negligence or for any matter which it would be illegal for us to exclude or attempt to exclude their liability. Your booking is accepted on the understanding that the cottage will be put at your disposal on the date agreed with us. Should this not be possible due to circumstances beyond our reasonable control, we cannot guarantee to provide an alternative holiday property. In this case the rental you have paid will be returned to you in full and you will have no further claim against us. Part of the charm of the countryside, with the beauty of our natural scenery and our distance from the bustle of the city, means that we have less security of supply of services that are taken for granted in cities. Thankfully problems such as power cuts or uncooperative septic tanks are few and far between at Crumble Cottage. In the unlikely event of any such problems during your stay with us we will use our reasonable endeavours to procure their early resolution on receiving notice thereof. However, for the avoidance of doubt, you accept that as the extent of our liability. All complaints must be notified to us as soon as reasonably practicable, as we may be required to carry out an on-the-spot investigation followed by remedial action. Guests have a legal obligation to mitigate their loss. If we are denied the opportunity of investigating the complaint within a reasonable time or denied the opportunity to put matters right during the holiday, then the guest will waive all rights. We will do our utmost to ensure that any problems are resolved quickly and to your complete satisfaction. You should be aware that you have a legal liability to pay for any damages you may cause during your holiday. Crumble Cottage is insured for the usual risks covered by a building and contents policy. However, in certain circumstances, if you should cause any loss or damage by negligence, you could become liable and you would probably not be covered by the personal liability section of your own household policy. Our insurance does not cover your personal possessions. You are advised to check on these points with your insurers. You may find that, providing they are given notice, they will extend your normal cover to include your holiday home. These Terms & Conditions are governed and should be interpreted by the laws of England and Wales.